The spacious sides and end panels of the Black Slatwall Gondola Unit is sure to satisfy your display needs. These fashionable black display merchandisers are attractive without sacrificing shelf space or strength. Customize the shelf spacing and show off any size merchandise with this unit. 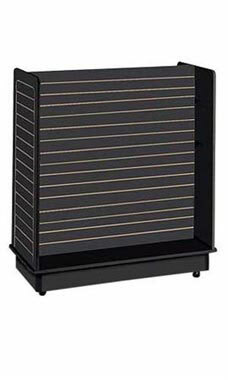 The Black Slatwall Gondola Unit is 24"W x 48"L x 54"H with a 6"H base and includes casters. Put this display merchandiser to use in your store to help organize product displays and instantly attract customers. This unit is in stock and available for immediate shipment!